It features the 1922-24 definitives, through which we can see the hyperinflation that affected Austria after World War 1. This issue is highlighted by rainbow matting, whereby each color signifies one of nine different rate periods. 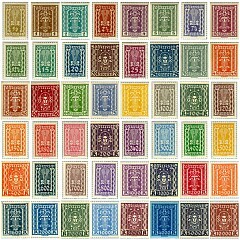 The stamps (at present printed scans only) are illustrated in order of date issued, and match up to the rate periods where the covers are shown. Covers for other rate periods are matted in light gray. Any covers not matted are either eBay scans or scans from ser1851's bidStart listings. At present, due to time constraints, display pages up to only 1925 will be available. Click on a rate period to see the cover(s) pertaining to that period. If you have any questions, corrections or additions to these pages, please drop me a line at .